For the third consecutive year, the DHC+ Technology Platform launched its Student Awards competition to give students of extraordinary potential the opportunity to make their research known and benefit from a wide range of prizes. In order to be recognised, the research shall contribute to the development, growth and improved efficiency of District Heating and Cooling on a local, national or international level. The jury – composed of eight international DHC experts and presided by the Chairman of the DHC+ Education & Training Working Group – was entrusted with evaluating the research papers that came from all over the world, which resulted in the following conclusions. 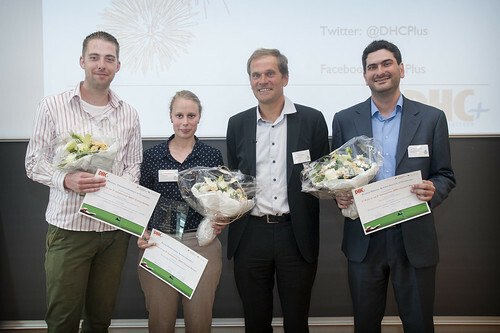 The Student Awards ceremony took place on 26 August 2015 during the International Conference on Smart Energy Systems and 4th Generation District Heating in Copenhagen. The conference gathered 190 researchers and experts from the energy and district heating industry. The winners of the Student Awards had the opportunity to present their work during one of the dedicated sessions and received the awards from Bertrand Guillemot, Chairman of the DHC+ Technology Platform. The first place winner received a 1.000 EUR research contribution and published an article in the International EuroHeat&Power Magazine no. III (2015), while the runners’-up articles were published in EuroHeat&Power no. IV (2015). Additionally, the top three applicants received a one year subscription to the magazine.